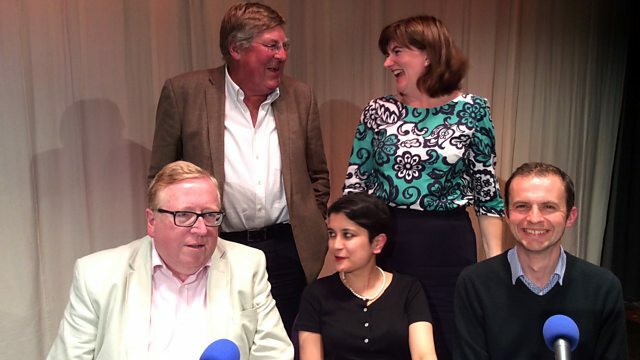 BBC Radio 4 - Any Questions?, Shami Chakrabarti, Stephen Gethins MP, Simon Heffer, Nicky Morgan MP. Ed Stourton presents political debate from Heswall Hall on the Wirral with Shami Chakrabarti, Stephen Gethins MP, Simon Heffer and Nicky Morgan MP. Ed Stourton presents political debate from Heswall Hall on the Wirral with the Shadow Attorney General Shami Chakrabarti, the SNP's Europe Spokesman at Westminster Stephen Gethins MP, the Sunday Telegraph columnist Simon Heffer and the new chair of the Treasury Select Committee Nicky Morgan MP. Topics discussed included Brexit, Charlie Gard, Tuition fees and University places, and VISA are reportedly paying businesses not to accept notes and coins. Are we to be a cashless society and is this to be welcomed?